Hello, and Happy Spring! I just got back from the SCOLT conference for the 2nd time ever, and this time I got to present! So this post, fair warning, is going to be partly about my process of submitting and doing a presentation, and the other part about the actual stations presentation as it happened. If you hang with me, I promise there will be something here you can use. Also, I HIGHLY SUGGEST that you submit a presentation to your local state organization, or if that freaks you out, offer to present something at a department meeting or something like that. We don’t have enough PD in the world that’s practical and done by teachers about what’s really working (or not working) in our classrooms. Every one of you out there reading this has some type of success in your classroom that should be showcased, and some insight to share…please share it with us! I mean, seriously…this is me at the presentation, basically hanging out with a bunch of teachers and talking about what I do in my classroom. What’s more fun than that? So my big, brilliant idea was to talk for a bit in the session, and then have everyone actually run through a rotation of actual stations activities. 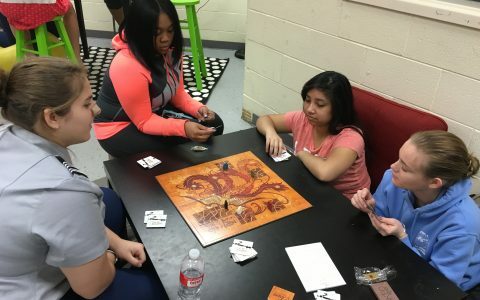 I figured if we had tables set up or something, we could actually play the different games or see the activities in action. Did you see the 2 big potential issues in that last sentence? Yeah…tables AND games and activities…yeah…nope…didn’t think about it as an issue. I was too psyched about the idea of it, so…I clicked SUBMIT, and off it went. I got the acceptance of my proposal, and was SOOOO EXCITED! Then as the time drew nearer to actually going to the conference, I realized that I actually had to write the presentation, and the idea of that started to freak me out a bit. I know I operate from a very visual place, and the best way I could think of was to start searching my phone for pics of my classroom during stations or activities, and I just starting chunking those pics into Google Slides. Then I wandered around my classroom, my office, and my garage at home, and picked out a sampling of toys, games, and props that I would use as each of the stations. With a box full of stuff in my arms, I realized that the contents of that box were going to have to fit in my suitcase to go to Orlando…ugh. This is what the table at my hotel room looked like once I unpacked my suitcase. It was at this point where I decided I needed to decide the purpose of the session in terms of I Can statements, so I went back and wrote those. Not a great backward design model, but it’s my process…So, with my I Can statements, and a box of stuff I was now going to have to fit into a suitcase, I started on the presentation. 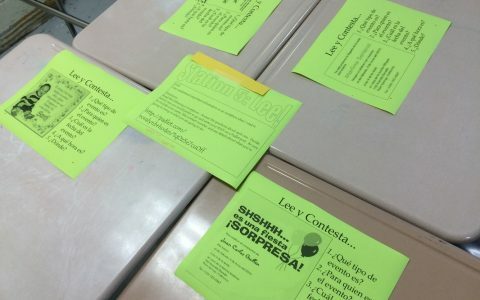 I can understand (and explain to a colleague in my building) how stations can be used to increase personalization, differentiation, and conversation in my classroom. I can recall the logistical dos and don’ts of stations as I plan, so that my station support learning, not chaos. 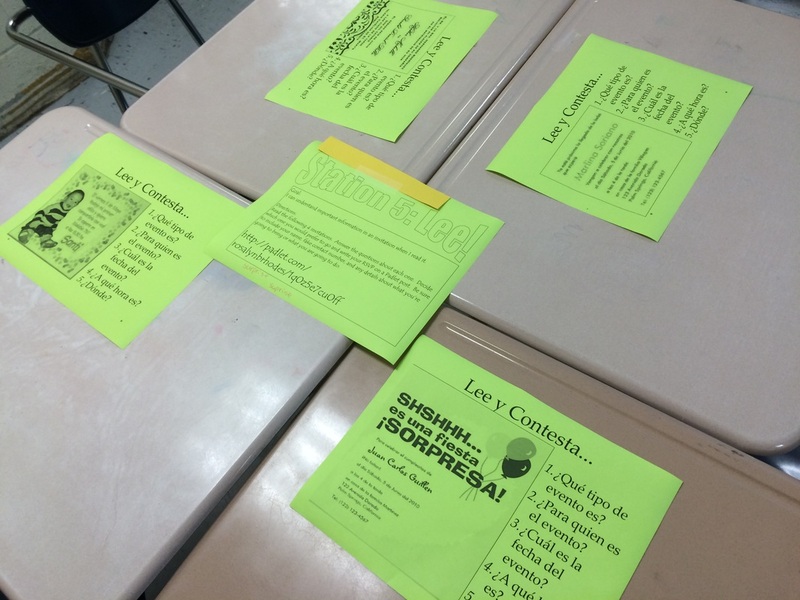 I can keep in mind the types of content activities that should go into each station in order to maximize learning. I know that the most important reason that teachers don’t do stations is FEAR. There’s so much fear surrounding having all the kids doing different activities and moving around a classroom. What if they all mutiny and run away? What if they destroy my stations? What if they don’t actual move to the next when they’re supposed to? What if total chaos erupts everywhere and I have to call security and they judge me (or don’t even come…)? What if they’re all speaking English instead of the target language and nothing actually gets done? I get it. I’ve been there. In thinking about that, what I decided might be helpful was a breakdown of “Logistics Dos & Don’ts” in the presentation to help any teacher who wanted to try Stations. Hopefully, this will help you not make the mistakes I did as I was learning how to do Stations in my own classroom. In the actual presentation I’ve linked at the bottom you can see a more detailed explanation of each logistical piece. Fair warning, even the best intentions run into bumps in the process. Sometimes you just forget something simple, and it messes everything up. Don’t panic! Laugh it off, fix it, and move forward. Your class knows you’re a well-intentioned human. Trust me, I created a whole round of stations (um…this year) and forgot completely to number them and make a route, and the whole class stood up when they were supposed to and tried to move to the next station, but there was no “next”…I had 20 children milling about while I had to run around direct them to their new spots. One thing I never mentioned in the logistics is that if you have a really big class, for example, 32+ kids, don’t make 8+ individual stations for them because they’ll never get to that many and the times would be so short that it wouldn’t be worth doing. Instead, make 4 stations and set them up in 2 separate circuits. That way, half your kids run the “pink” circuit and do stations 1-4, and the other half of your kids run the “green” circuit and do stations 1-4, but they never mix. I use colored paper when I can get it, so it’s really clear which is which, but you can also scribble a design with a marker around the edges of the station title, and it works the same way. 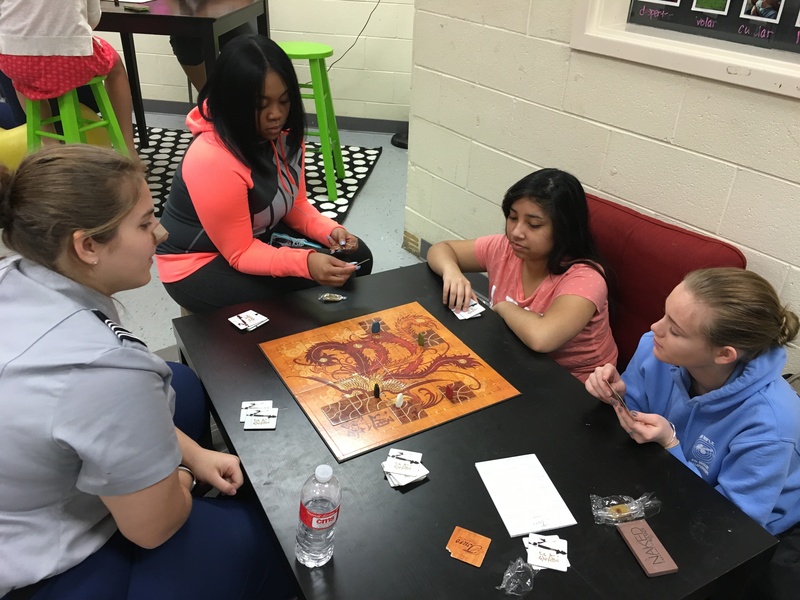 If you do it like that, they have time to do the 4 stations and the reflection station at the end and no one is stressed….bonus, you don’t have to make 8 different tasks! 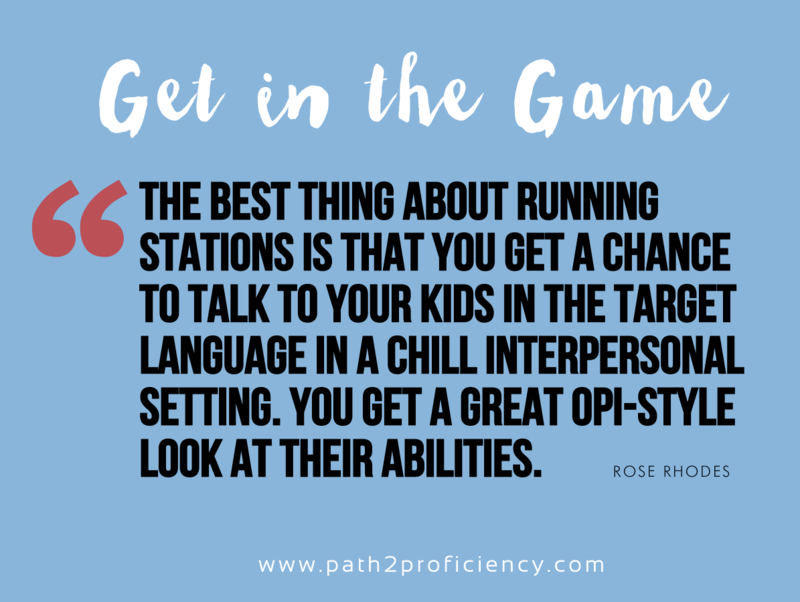 When I plan my stations, I try to dedicate 1 station to conversational, OPI-style speaking, where I just talk to them and adjust the conversation as I need to. It’s the most important station, really, because I get to assess each student’s interpersonal ability in a low-stress environment. How often in a regular class do you get to spend 10 minutes in target-language conversation with 4 or 5 kids? Never, right? If you’re running 2 circuits, use one of your native speakers as the “expert” in the circuit you aren’t in. Obviously, they can’t assess their classmates, but they can at least keep the conversation going. You’d be amazed at how hard your native speakers will work when they’re the experts, and equally how patient they are with their classmates. 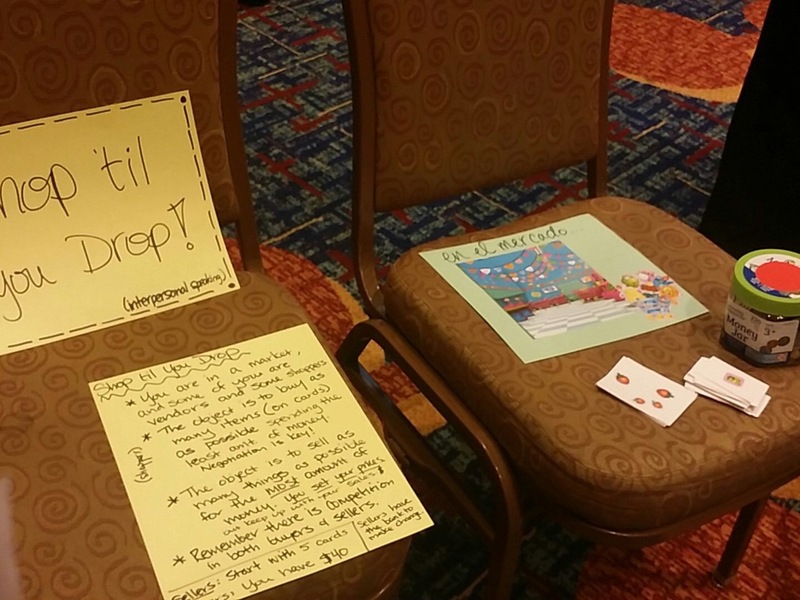 Back to my presentation: it was laid out on chairs, in little semi-circles, with the activity in the middle. I made nine makeshift stations, and everyone around and played with the activities. Huge thank you to my amazing friend, Laura Sexton (@SraSpanglish) for helping me with furniture moving and layout of all the things. The whole thing would have been a disaster without her. My original idea of having everyone visit every station didn’t really work because we ran out of time, but we talked through a bunch of activities and then everyone took pictures afterwards. The most important thing to say about the activities in a stations circuit is that they should all have an I Can statement that makes them purposeful, and be communicative and fun. A worksheet at a station makes for a more brainless activity, so they can speak English and fill in Spanish at the same time, and it’s really not that fun. That’s not what we want. We want the kids using the language while they’re working in every station. 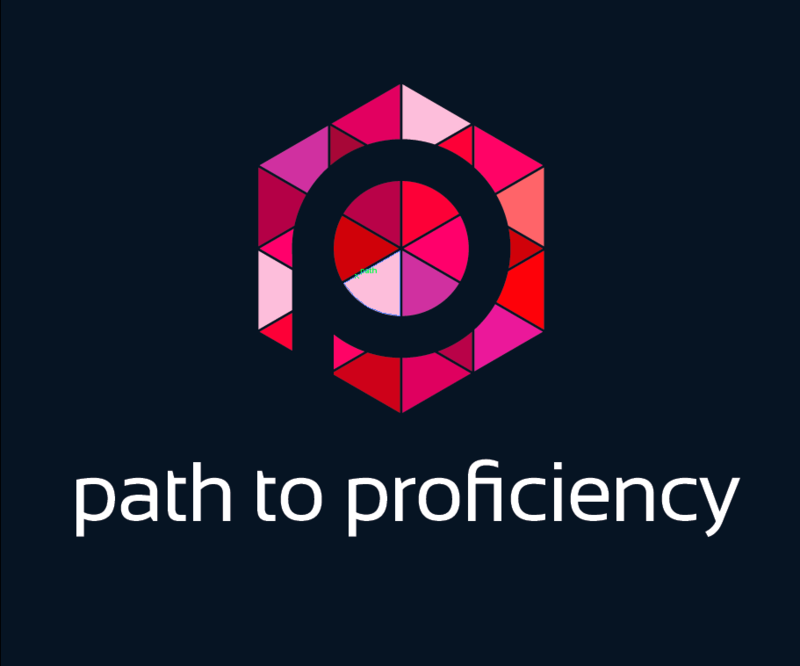 For one thing, that’s the point of what we do, but for another, it really cuts down the English side-conversation if they have activities that require them to think and speak and create in the target language. There are soooo many options when it comes to tasks in Stations. 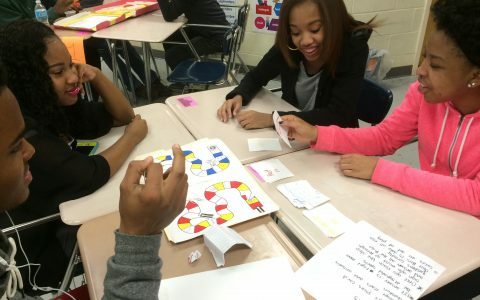 You can use something you were going to do as a whole-class activity and use it in a station instead, or you can use a game you already own and write a target language task that can accompany it. I do that a lot. 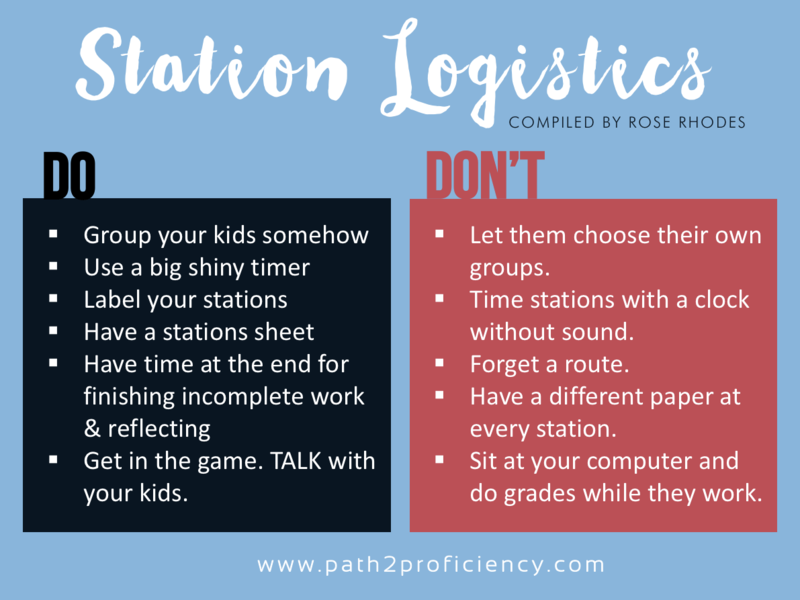 I know this was kind of a gloss over the logistics and the activities that you can do in stations, but that’s just because I’m leaving you with 2 important links that I hope will be super helpful to you as you implement stations in your own classroom. 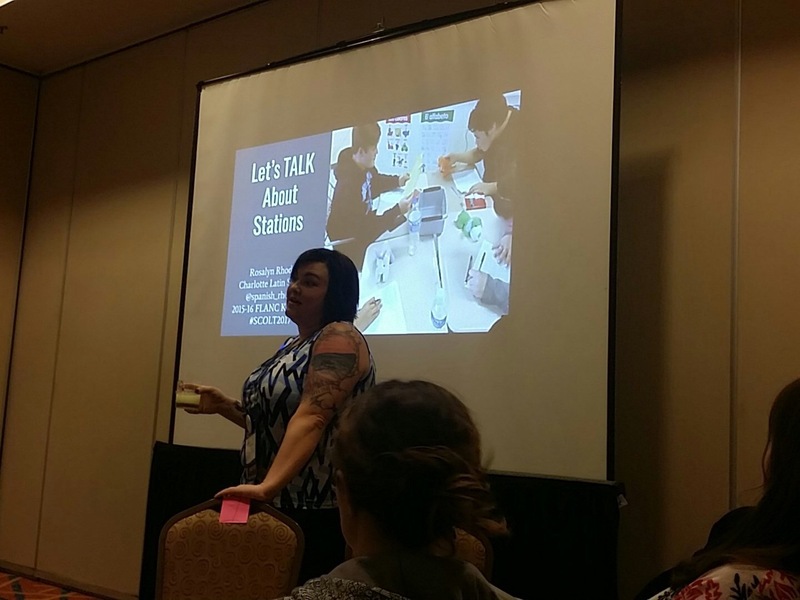 Let’s TALK About Stations Is the whole presentation I did at SCOLT, and each slide has detailed and step by step information on the Dos & Don’ts of setting up stations in your own classroom. It also has explanations of a variety of possible activities that you can do. http://spanishrhodes.weebly.com/content-activities/round-and-round-they-go This link will take you to my personal website that has a longer and more complete explanation of how to run stations, including a few downloads of an answer sheet and grouping cards. If you have more questions, I’m always here! Hope this helps, and please have fun! This is outstanding! Too often, people explain without showing – but your extra links with project examples are just what we need. I’m using this (my own French version) in a few weeks. Can’t wait to share with my coworkers your awesomeness!